IFS 12: Gladiators Collide | MMA Fighting Events Videos Techniques UFC Fight Picks and News. If you're in the Los Angeles area and you're attempting to turn a boxing or Muay Thai fan on to MMA (Mixed Martial Arts), the IFS (International Fight Showdown) event is a good one to start with. Boxing and Muay Thai fans love seeing a good stand up war, but are sometimes turned off to the ground game. The IFS is changing all that with their brand of fighting. The IFS came up with an innovative idea and changed up the normal MMA round system a bit so as to feature stand up fighting while still allowing full on MMA. Under the IFS, the fights are still three rounds. However, the first round is all boxing with boxing rules but MMA gloves. The second round is Muay Thai with Muay Thai rules but MMA gloves. If the fighters make it to the third round, that one is full on MMA. 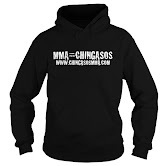 Yes, with MMA gloves! The fighters do not change gloves in between rounds. They fight the entire fight with the same MMA gloves. 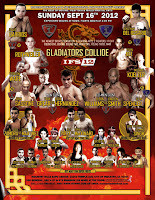 IFS 12: Gladiators Collide, will have plenty of action for those that attend. The event is broken up into Pro 1, AM 1 and Muay Thai. The Pro 1 will feature professional fighters mixing it up with the IFS special round system. The AM 1 will feature up and coming amateur fighters that are getting ready to make the leap to the next level. Last but not least, there will also be nine regular Muay Thai fights. 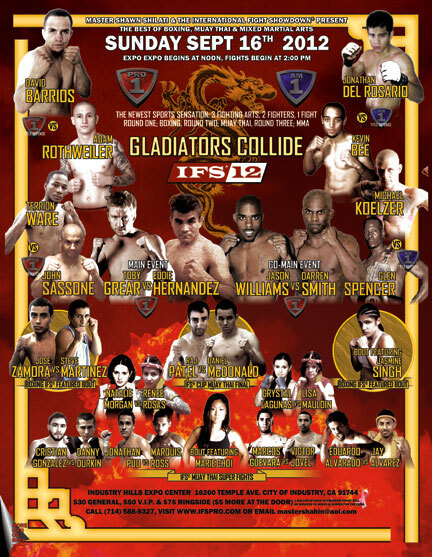 IFS 12: "Gladiators Collide" will take place September 16 at the Industry Hills Expo Center. The Expo will open at noon, and the fights get going at 2 p.m.
General admission is $30. To get your tickets, you can call (714) 588-9327, or visit www.IFSPRO.com. Here's the complete fight Card for IFS 12: "Gladiotors Collide"